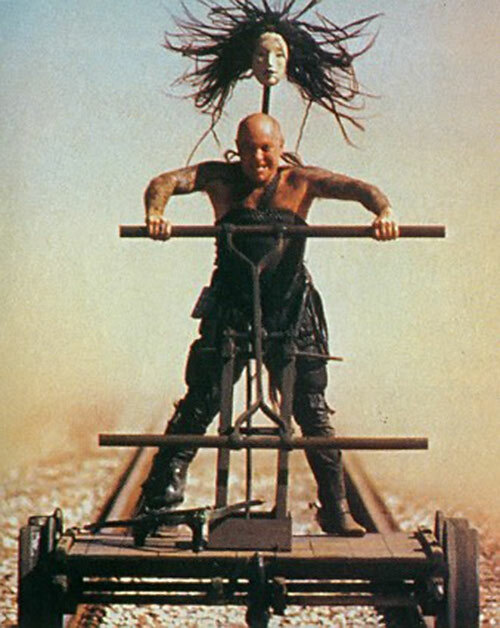 Ironbar is a minor character in the second Mad Max movie. He was played by rock singer Angry Anderson . Height: 5’5″	Weight: 140 lbs. Ironbar was an adequate fighter. He had enough brains and strength of presence to lead the Bartertown guards, though he certainly wasn’t competing among the best and brightest in that regard. He had a good nose for interesting and unusual things. For instance he picked up the potential threat that Mad Max presented as soon as the road warrior entered Bartertown. Like a cockroach, Ironbar had incredibly good luck when it came to surviving against the odds. Whenever he found himself in a situation that seemed like serious injury or death was certain, some stroke of luck would save him, such as falls from great heights being interrupted by some fortuitous object. Another example is when the vehicle he was on was obliterated by a train. Ironbar found himself blackened but unharmed, laid out upon the train’s prow as it continued rocketing down the tracks. Ironbar’s pre-apocalyptic life, whatever that may have been like, is long forgotten. After the nuclear apocalypse, Ironbar joined the security forces of Bartertown, a trading outpost that sprung out of the desert after the war. Ironbar became head of the Bartertown guards by virtue of being minimally smarter and more charismatic than his fellows. This relatively idyllic life for Ironbar was rudely interrupted when the nomadic warrior known as Mad Max came to Bartertown. Mad Max was recruited by Bartertown’s mayor, Aunty Entity. The job was to help depose the town’s engineer and his bodyguard, collectively known as MasterBlaster. 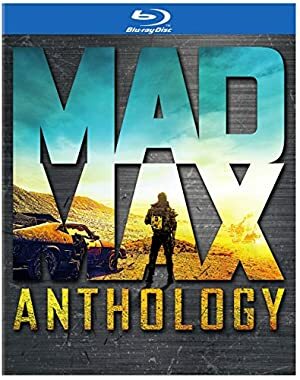 After a series of bargains and betrayals, Mad Max and a group of teenagers from a local tribal settlement fled Bartertown with Master in tow. Ironbar and the rest of the Bartertown guard followed. Despite numerous brushed with death, Ironbar plagued the fleeing adventurers until their very last run-in. Literally so, as Max’s stolen vehicle crashed into the Bartertown fleet of cars, giving Max’s associates time to escape. Ironbar, wrapped in a cocoon of wrecked automotives, gave a final finger to the world before slipping away. Ironbar is a short White male with a leather outfit that leaves his shoulders and arms bare. This allows him to display the colorful tattoos on his arm, predominantly Asian dragons and the like. 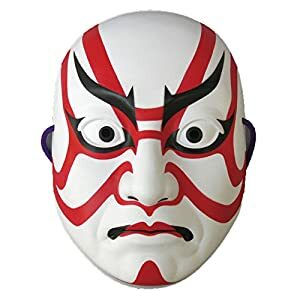 He gets his nom de guerre from the straight iron bar that runs along his back, holding a Noh mask above Ironbar’s head. The mask has a wig of brown hair flowing long enough to fall on Ironbar’s shoulders. As is usually preferred with underlings, Ironbar just follows orders and doesn’t make waves. He’s a little pushy with his subordinates but not to the point of being a serious bully. If someone causes him trouble, he’ll pursue them with great determination to extract revenge. Ironbar makes a fine mid-level henchman for any gang. Aunty Entity (Low), Bartertown guards (High). Ironbar usually carries some manner of melee weapon [BODY 04, EV 03(4 w/ STR)]. If there is a special event such as a festival, Ironbar and his guards will get out some form of ranged weaponry to help maintain control of the crowds under these more energetic conditions. This usually means small crossbows [BODY 03, Range: 03, Ammo: 01, R#03, Limitation: Long reload time] with half a dozen bolts [BODY 02, EV 03] and beat-up pre-war rifles with lousy ammo [BODY 04, Projectile weapon: 05, Ammo: 06, R#: 05]. Invulnerability was used rather than Dumb Luck or Luck because Ironbar only enjoyed good fortune in the specific circumstances mentioned above. He was otherwise neither tougher nor luckier than his stats suggest. 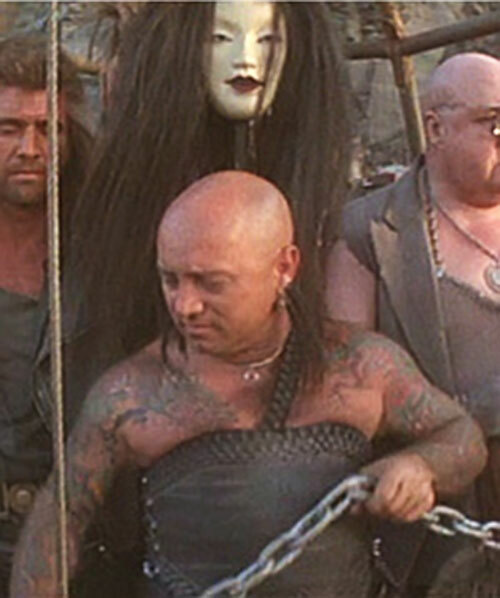 Ironbar’s Artist Skill was added for extra flavor and as a tip of the hat to Angry Anderson’s other celebrity vocation. The Bartertown guards would generally have 2s in all Attributes, Vehicles (Land): 02, and Weaponry (Firearms, Melee): 02. They would be armed with the same items as Ironbar. Ironbar’s Invulnerability does not represent a resistance to damage per se. Instead, it represents Ironbar’s extreme good luck at surviving incidents that should have seriously injured or killed him. Accordingly, he only uses an Invulnerability check at the moment he suffers Killing Damage that takes his Current BODY below 0 APs. If the roll is successful in raising his current BODY above 0, the damage becomes Bashing Damage and the GM may either explain what lucky event saved Ironbar’s life or simply have Ironbar inexplicably return to action a few moments later. If the roll fails, then the damage remains Killing Damage and no more Invulnerability checks are made until Ironbar fully recovers by normal means. Overall, this constitutes a -1FC Limitation. 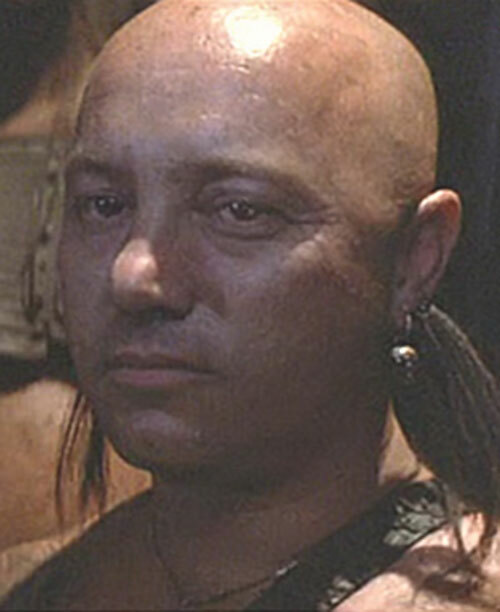 Source of Character: Mad Max Beyond Thunderdome (movie), character played by Angry Anderson.